Kansas voters might have more flexibility when it comes to where they cast ballots in future elections. The Kansas Legislature approved an update to a state election law that gives counties the option to adopt open polling. The bill is now awaiting the governor’s signature. The new policy allows voters to cast ballots at any polling place on Election Day instead of being required to use a designated location. That’s how the advance voting period has been handled for years. Sedgwick County Election Commissioner Tabitha Lehman says the election law change is a win for voters because it will make voting easier and more convenient. "You don’t have to only go one place," she says. "If there’s a line at one place, you can leave and go to another one where there isn’t a line." She says the county will still designate polling sites for voters, and continue mailing voting information. Voters who want to cast a paper ballot will only be able to do that at their designated polling location. She says it’s too cost prohibitive to offer paper ballots for every precinct at every polling location. The change would also help reduce the number of provisional ballots in each election. A provisional ballot is used if there is any doubt about a person’s eligibility to vote. 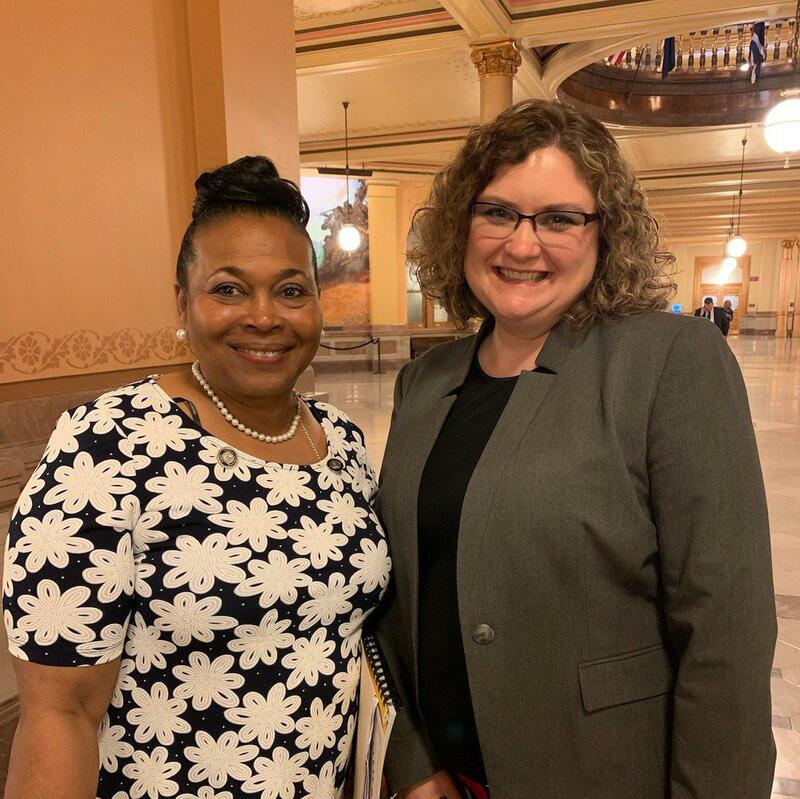 Democratic Kansas Sen. Oletha Faust-Goudeau of Wichita, left, and Sedgwick County Election Commissioner Tabitha Lehman at the State Capitol following Friday's vote on Senate Bill 130. Lehman has been advocating for the Election Day polling change for years. She says Sedgwick County and other counties finally have the technology in place to successfully handle the process. Sedgwick County spent about $6 million to upgrade its electronic voting equipment in 2017 with new machines that provide a backup paper ballot for auditing. Under the new policy, open polling will not be mandatory. County election officials will have the discretion to decide whether their county has the ability to offer open polling. At least 21 Kansas counties use electronic voting systems — like Sedgwick County’s — that make it easy for a voter to check in and vote at any polling place. The secretary of state’s office says 75 counties use an optical scan voting system, and eight counties use paper ballots. “You need to make sure especially if you don’t live in Sedgwick County, that you know whether or not your county is going to take advantage of this law before you go to vote,” Lehman says. It’s unclear if open polling will be used in the 2019 election cycle. Kansas Secretary of State Scott Schwab must first establish the rules and regulations before counties could implement the change. “We don’t know yet if we’ll be able to use it this fall. We will if we can, but we will definitely use it by 2020,” Lehman says. The new law would also provide protection for mail-in voting. Election staff would be required to try to notify voters who need to correct a missing or mismatched signature on ballot envelopes. This allows such voter the opportunity to correct the deficiency before the commencement of the final county canvass. Sedgwick County officials are planning to ask the Kansas Legislature to change election laws to make voting easier. When people use advance voting, they are able to cast ballots at the election office in downtown Wichita or other sites throughout the county. But on Election Day, voters must use their designated polling location. Sedgwick County Commission Chairman David Dennis says he wants lawmakers to change this policy to allow voters to use any polling place. Sedgwick County commissioners are working on a list of priorities for state lawmakers to take up during the 2019 legislative session. They held a meeting Tuesday to revise the county’s annual legislative platform before it comes up for a formal vote. The platform is an outline of key initiatives for the county's lobbyists and governmental representatives.